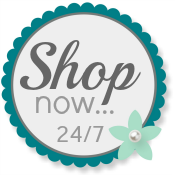 Single Stamps are now available from Stampin' Up! in three new "flavors!" The stamps are from the sets "Word Play", "Perfectly Penned" and "Seasonal Sayings". Stamp singles come in a cello bag and are available in clear mount only. (Recommended block sizes are listed on the flyers). Available now through January 2, 2013. This is a pilot program, so take advantage today! 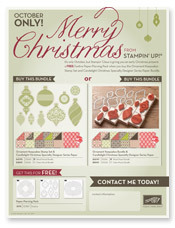 Now through October 31, 2012 Stampin' Up! offers a Christmas Gift with purchase! You get a FREE Festive Paper-Piercing Pack when you purchase the Ornament Keepsakes Set and Candlelight Christmas Specialty Designer Paper. You must use the special numbers above to receive your *FREE* Festive Paper-Piercing Pack. For every bundle you buy, you'll receive a free Festive Paper-Piercing Pack. Through October 31, 2012 only.